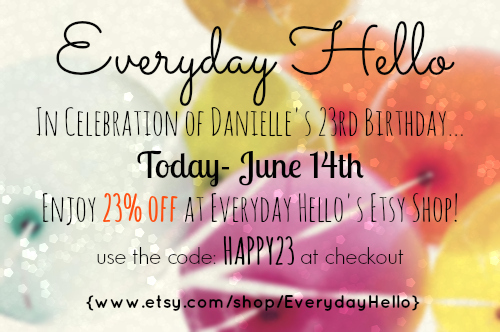 Everyday Hello: Sharing the Birthday Love! Hello Everyone! 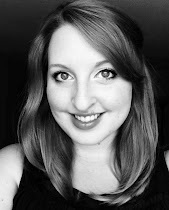 I'm so excited to be writing to you today with some very special news. #2- Today in honor of my birthday I am offering a special discount to all of you! This is my first ever coupon/discount offered at Everyday Hello, so as you can imagine I am totally pumped! 1. Log on to Everyday Hello's Etsy Page. 2. Select a pre-made card, custom card, or card set that you would love to own! 4. Enjoy a 23% savings on anything in the store! 5. Receive your cards in the mail and start to spread the love. *This discount is only good for Today- June 14th! So log on right now and don't miss out! *If you need some ideas on past cards I've created check out the gallery on Everyday Hello's website!